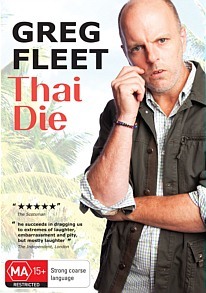 Greg Fleet: Thai Die DVD Review. The show, filmed in 2011 at Melbourne’s Comic Lounge, finds ‘Medallions’ in fine fettle, and with a half dozen additional songs, bits and sketches rounding out the disc marks an excellent and truly worthwhile home media release from one of Australia’s most underrated comics. Aussie comic Greg Fleet perhaps never truly rose to international prominence, thanks in part to his oft-touted heroin addiction and sizable capacity for self-destruction, but for the best part of two decades has been steadily honing his craft and can now rightfully take his place amongst the hallowed pantheon of this country’s greatest comedians. Boasting several years of sobriety and a newly burgeoning waistline, Fleet recently decided to revisit his past in the form of the hour-long Thai Die, a show which recounts a trip he took to Thailand and Burma in the late 1980s. A disaster from the get-go, the two-week jaunt quickly descended into nightmare when the trusting young Fleety accepted an offer from a friendly Thai to visit his family and experience ‘the real Thailand.’ Several hours later the then Neighbours writer found himself in a small village in the countryside, with no idea where he was or how to get back to Bangkok. Worse, he hadn’t thought to inform anyone back home where he was going, had no knowledge of the local language and, as it quickly became apparent, the family of the Thai fellow would have few compunctions about robbing him of everything they could and then disposing of him in an unfriendly fashion. Far from being a cavalcade of woe, Fleet takes the opportunity in Thai Die to indulge in a crowd-pleasing blend of wry reminiscence and gently disparaging self-remonstrance, poking fun at his own youthful naivety and expertly building the tension during his tale’s more hairy sequences. The show, filmed in 2011 at Melbourne’s Comic Lounge, finds ‘Medallions’ in fine fettle, and with a half dozen additional songs, bits and sketches rounding out the disc marks an excellent and truly worthwhile home media release from one of Australia’s most underrated comics. The picture is quite soft and slightly grainy during the main feature, and the use of two mostly static cameras throughout combined with the show’s cursory visuals doesn’t exactly equate to it leaping off the screen. Audio quality is also rather rudimentary, and the fairly basic two-channel soundtrack is serviceable without being anything spectacular.